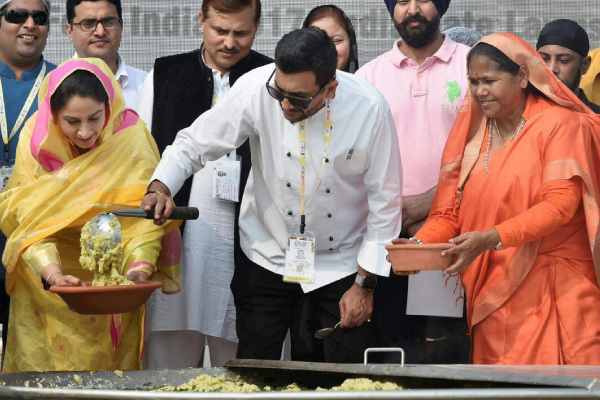 On November 4, 2017, Akshaya Patra was the distribution partner at the World Food India 2017 event, where the largest serving of Khichdi – 918 kgs – was prepared by a team of 50 people led by Chef Sanjeev Kapoor, the brand ambassador of The Great India Food Street, and Akshaya Patra. This endeavour set a new Guinness World Record. The Khichdi was distributed among ambassadors and other dignitaries who were present at the event. It was also distributed to people in slum areas in Delhi by Akshaya Patra.